The Houston Oilers began in 1960 as a charter member of the American Football League. They were owned by Bud Adams, a Houston oilman, who had made several previous unsuccessful bids for an NFL expansion team in Houston. Adams was an influential member of the eight original AFL owners, since he, Dallas Texans/Kansas City Chiefs founder Lamar Hunt and Buffalo Bills founder Ralph Wilson were more financially stable than the other five all three would go on to own their franchises for over forty years, whereas the others pulled out by the 1980s. The 1960 American Football League Championship Game was the first AFL title game, played on New Year’s Day 1961 at Jeppesen Stadium in Houston, Texas. With New Year’s on Sunday, the major college bowl games were played on Monday, January 2. 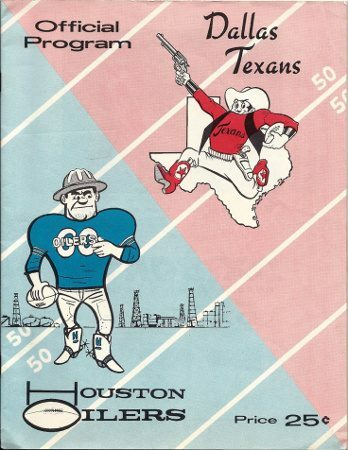 The game matched the Eastern Division champion Houston Oilers (10–4), against the Western Division champion Los Angeles Chargers (10–4), in the first championship game of the new American Football League. The host Oilers were a 6½-point favorite. 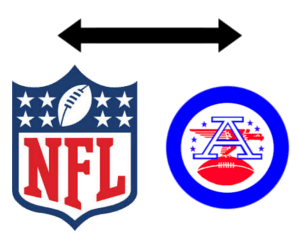 The AFL had established a format in which championship games would be alternated each year between the Western Division winners and the Eastern Division. The first game was originally scheduled to be played in the cavernous Los Angeles Coliseum, but it was moved to the cozier Jeppesen Stadium in Houston, where it drew 32,183. It rained the five days prior to the game. 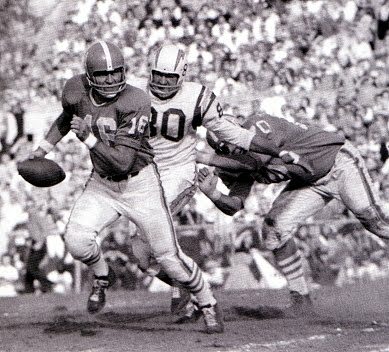 Oilers’ quarterback George Blanda had retired after ten seasons in the NFL and did not play during the 1959 season; he threw three touchdown passes (and kicked a field goal and three extra points) to lead Houston to the first AFL title, 24–16. 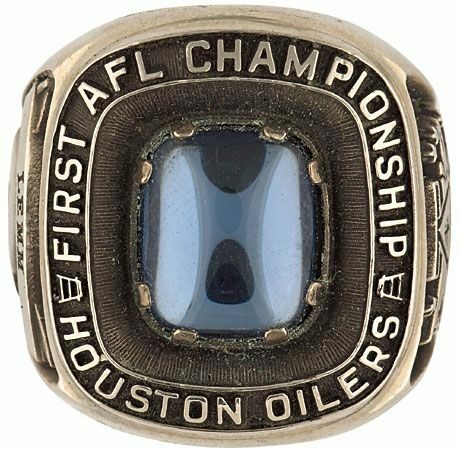 The Oilers won the AFL Eastern Division title again in 1967, then became the first professional football team to play in a domed stadium, when they moved into Houston’s Astrodome for the 1968 season. Previously, the Oilers had played at Jeppesen Stadium at the University of Houston (now called Robertson Stadium) from 1960 to 1964, and Rice University’s stadium from 1965 to 1967. The years immediately after the AFL-NFL Merger were not as kind to the Oilers, who sank to the bottom of the AFC Central division. After going 3-10-1 in 1970, they went 4-9-1 in 1971, and then suffered back-to-back 1-13 seasons in 1972-73. But by 1974, the Oilers led by Hall of Fame coach Sid Gilman brought the team back to respectability by reaching .500 at season’s end. At the same time, Adams again lobbied the city for a new stadium, one with club seating and other revenue generators present in recently–built NFL stadiums, and he committed to pay for 25% of the cost of a new stadium. However, mayor Bob Lanier initially supported Adams bid for a new stadium privately, but refused to publicly support the project. 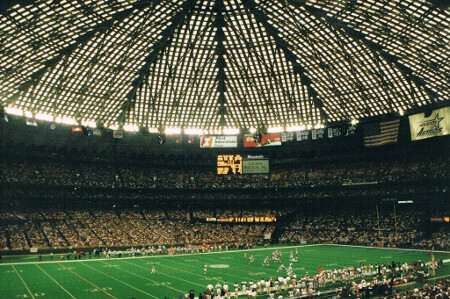 Although Houstonians wanted to keep the Oilers, they were leery of investing more money on a stadium so soon after the Astrodome improvements. The city was also still struggling to recover from the oil collapse of the 1980s. Adams, sensing that he was not going to get the stadium he wanted, began shopping the Oilers to other cities. He was particularly intrigued by Nashville, and opened secret talks with mayor Phil Bredesen. At the end of the 1995 season, Adams announced that the Oilers would be moving to Nashville for the 1998 season. City officials there promised to contribute $144 million toward a new stadium, as well as $70 million in ticket sales. At that point, support for the Oilers in the Houston area all but disappeared. 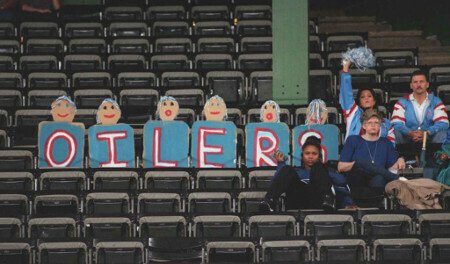 The 1996 season was a disaster for the Oilers; they played before crowds of fewer than 20,000 and games were so quiet that it was possible to hear conversations on the field from the grandstand. Meanwhile, the team’s radio network, which once stretched across the state, was reduced to the flagship station in Houston and a few affiliates in Tennessee. By October 1996 the flagship station (KTRH) was cutting off games prior to their finish in favor of the Houston Rockets pre-game show. The team went 8–8, finishing 6–2 in road games and only 2–6 in home games. Adams, the city and the league were unwilling to see this continue for another season, so a deal was reached to let the Oilers out of their lease a year early and move to Tennessee. In 1999, Robert McNair was awarded, at a cost of $1 billion, an expansion team which replaced the Oilers in Houston. The franchise became the Houston Texans, which adopted a similar red, white and blue team color tandem and inherited the sports complex the Oilers had played in, but not the Oilers’ former home; NRG Stadium would be built next door to the Astrodome in 2002. The professional American football team now known as the Tennessee Titans previously played in Houston, Texas, from 1960 to 1996. This article chronicles the team's history during their time as the Houston Oilers during that period. The Oilers began play in 1960 as a charter member of the American Football League (AFL). The team won two AFL championships before joining the NFL as part of the AFL - NFL merger in the late 1960s. Oilers - Named for the Oil industry for sentimental and social reasons, in that it is the largest part of the economy and workforce in Texas, as many cities were found on oil. Who is the greatest Houston Oilers? The Oilers began play in 1960 as a charter member of the American Football League (AFL).